I read here that Apps for mobile devices have created 466,000 American Jobs since 2008. Of those 466,000, an estimated 155,000 people work in app development and tech support, while 311,000 people work in marketing and design. That’s a hefty support for our staggering economy. But, the other side of the bloating App market is the rise of fraudulent App marketers. In the Touch Arcades forum, a post was made about an “ad network that guaranteed to get an app into the Top 25 in the app store for $5000.” The person who posted this, “walterkaman,” is an app developer and he went to go see this company, where he was walked down with all the apps in the Top 25 that were their clients. The list goes as follows: #4 – Tiny Pets, #5 – Social Girl, #6 – Fluff Friends, #10 – Pet Town, #12 – Crime City, #13 – VIP Poker, #16 – Sweet Shop, #19 – Top Girl. 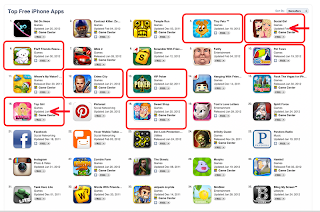 These fraud apps are put in the Top 25 through automatic downloads generated by a bot farm. 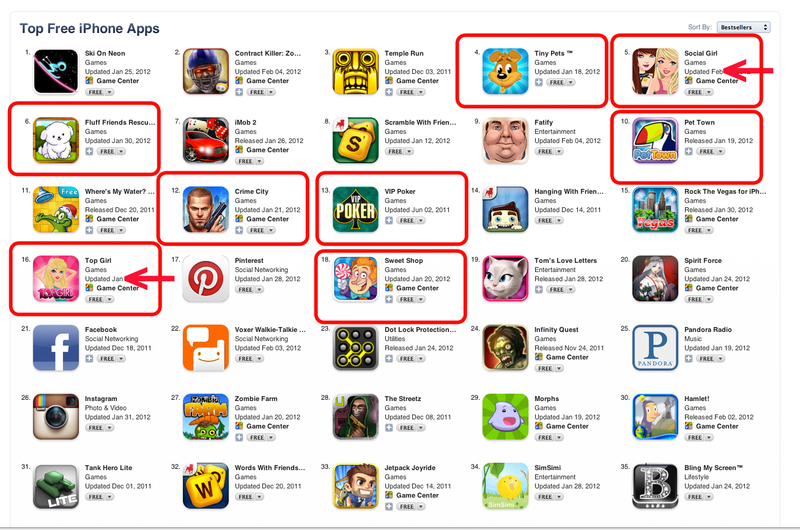 App developers need to be proud of what they create. There’s nothing personal or aesthetic about those apps. So many people choose to take on a job that means nothing but rigging someone else, but a true job should be purely out of ones joy and excitement.